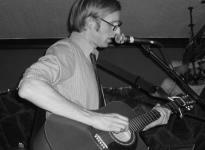 James 'Yuilly' Yuill looks geeky and awkward on stage, but appearances can be deceiving: his music is anything but that. A one-man band armed with a laptop, mixing decks and an acoustic guitar, he’s a DIY man with his own home studio on stage. The crowd is rowdy tonight and there is a feeling of anticipation in the air. By the first beat it’s impossible to get anywhere near the stage, the current buzz around this artist is working in his favor; tonight is easily a sell-out. The London-based musician's music is polished and spans a range of genres, making him an automatic crowd-pleaser for whatever does it for you. Signed to Kate Nash's label Moshi Moshi records, James Yuill effortlessly entertains with palatable, subtle dance tunes and game-boy style melodies; think more Benicassim than Ibiza. The music quickly transcends the crowd into a dream-like trance reminiscent of The Postal Service, but still gets everyone jerking around like a Crystal Castles track. This guy's a true individual, jumping around from pumping synth, eletronica bleeps to more mellow strumming guitar sequences. The front row is packed with trendy kids filming on their phones, desperate to brag to their mates later that they were there. But tonight’s musical offerings aren’t just about the electronica - the grooves occasionally give off a folk vibe and it’s no surprise he’s labelled 'folktronica'. Take the track 'This Sweet Love', with its combo of jangly, plucky guitar and sweet melancholy lyrics. Luckily, it comes off more Nick Drake than James Blunt and is easily one of his best tracks this evening. It acts as proof of Yuill’s ability to blend a variety of genres without sounding messy, whilst confidently showing off his romantic side; many songs express an innate craving to love. Maybe he’s not had much luck with the ladies? Scanning the crowd it’s clear his genre-blending beats give him a wide appeal and the dance heads are right at home hanging with the indie kids. Disappointingly, mid-set things take a dip and the tunes start to blend together, making it hard to distinguish between songs. This seems to contradict the fact that one of his main selling points is that his material is actually very contrasting. But Yuill quickly turns it around, ending with a 'throw your hands in the air' dance floor-filler beat. The one-man show leaves everyone in the mood to strut their stuff and knock out some shapes this Saturday night. James takes the party with him and as soon as he exits the stage The Macbeth completely empties within minutes. Maybe his luck with women is about to change.